Mirah Belle introduces unadulterated, pure essential oils that improve the health of your skin, hair and body. These 100% Pure Essential Oils offer a variety of benefits from cosmetic, dietary purposes and are known for their healing effects mentally, physically and emotionally. 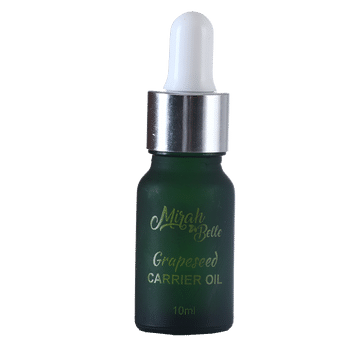 Mirah Belle's Grape seed Essential Oil has amazing health benefits. It promotes hair growth, has exceptional cleansing properties and enhances skin elasticity to prevent symptoms of premature aging. It is suitable to be used on skin and hair. Grape seed oil for the hair: The Grape seed oil is an excellent choice for hair care as it contains Vitamin E which is essential for the growth of hair. The extensive proteins, linoleic acid and minerals present in the grape seed oil is also very beneficial for the hair. Grape seed oil for the skin: Most of the cosmetic companies prefer grape seed oil as their base. The grape seed oil contains Vitamin C, D and E which is beneficial in reducing wrinkles and scars.